Grilled, Marinated Turkey Cutlets, from Thyme for Cooking's seasonal menus. Leftovers, stir-fried greens and thin turkey cutlets make a very easy, fast dinner. 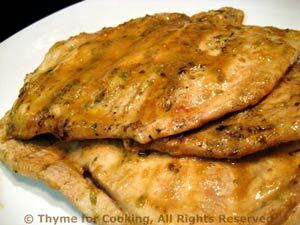 Thin turkey cutlets go well with any marinade and are quickly cooked for an easy main course. Thin pork or veal cutlets can be substituted, or chicken breasts. If you can't find turkey, and want it, buy a breast or tenderloin and either have your butcher slice it or do it yourself. In small bowl whisk together all ingredients except turkey. Put turkey in a dish and pour marinade over. Let marinate for 15 - 20 minutes or up to 2 hours. Remove from marinade and cook on hot barbecue grill for 3 - 4 minutes per side or until done. OR sauté in nonstick skillet for 4 - 6 minutes a side or until done. 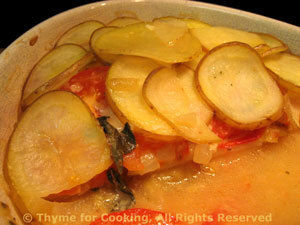 Remove from fridge and gently reheat - either the micro or the oven. Micro: 3 - 4 minutes; oven: 15 minutes 350F (175c). 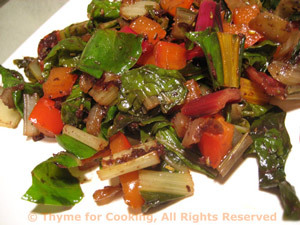 Rainbow Chard, Red Pepper and Onion makes a colorful, flavorful side dish that is stir-fried quickly. Stack the leaves together and fold over, the long way. Slice into thin strips, using both leaves and stems, but keeping the stems separate. Heat oil in a large skillet. Add the onion, pepper, and chard stems. Stir-fry over medium heat until onion is transparent and vegetables start to get tender, about 8 minutes. Add the chard leaves, oregano, and stir until the leaves soften and fit into the skillet. Cook another 2 - 3 minutes. Stir in vinegar, soy sauce, and serve.